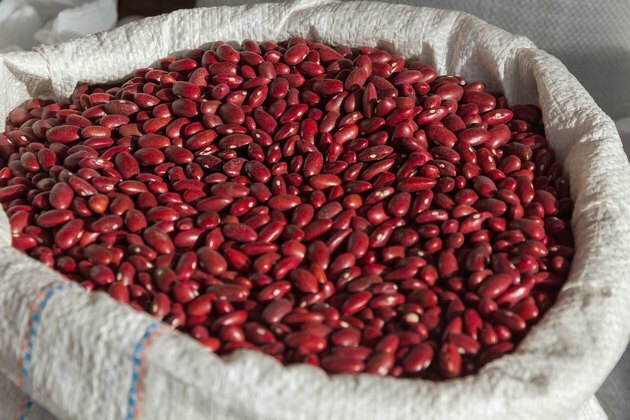 Red kidney beans are a good source of fiber, folate, magnesium, phosphorus, manganese, iron, copper and potassium. Eating beans, including kidney beans, more often may help reduce your risk for heart disease, cancer and diabetes, according to North Dakota State University Extension, and may also help you lose weight. This may be due to the fiber and protein they contain. Women who consumed more fiber were less likely to gain weight than those who consumed less fiber in a study published in March 2009 in the "Journal of Nutrition." Fiber-rich foods are low in energy density, so they take up a lot of space in your stomach without providing a lot of calories. Foods containing soluble fiber also slow the emptying of your stomach, so you feel full longer. Red kidney beans are an excellent source of fiber, providing 16.5 grams, or 66 percent of the daily value, in each cup. Red kidney beans are also a good source of protein, with 16.2 grams per cup. Protein is more filling than either carbohydrates or fat. The increased satiety experienced after eating protein-rich foods, such as kidney beans, may help you eat fewer calories throughout the day, helping to promote weight loss. People who eat beans are less likely to be obese and more likely to have a smaller waist and lower body weight than people who don't eat beans, according to a study published in the "Journal of the American College of Nutrition" in October 2008. Another study, published in the "European Journal of Nutrition" in February 2011, found that people who ate four servings of beans per week as part of a low-calorie diet lost more weight and had greater improvements in inflammation, blood pressure and cholesterol levels than those who followed a low-calorie diet that didn't include beans. A low-calorie diet high in legumes, such as kidney beans, is just as effective for weight loss as a low-calorie, high-protein diet and more effective than a low-calorie diet high in fatty fish, according to a study published in the "Journal of Medicinal Food" in February 2009. The legume diet was also associated with greater reductions in cholesterol levels than the other diets, making it a healthier diet overall. Use kidney beans in place of other foods higher in fat, calories and energy density. For example, replace half or all of the meat in your favorite chili recipe with kidney beans, add kidney beans to vegetable soup instead of chicken or beef or add these nutritious beans to your favorite salad to give it a protein boost.